We keep you informed about your car repair status. When you bring your car to AutoStream Car Care Center for auto repair or maintenance services you’ll never be left in the dark about the status of your vehicle. Our cutting-edge Online Courtesy Check technology allows us to easily keep in contact with you by sending service updates right to your phone so you stay completely informed! After you drop off your vehicle for service, our ASE Certified Mechanics will thoroughly look over your automobile and then send you our diagnosis right to your phone! No need to wonder about the status of your vehicle, we can easily communicate through your preference of email or text message. We want your experience with us to be as easy as possible. See Pictures of the Auto Parts in YOUR Vehicle! 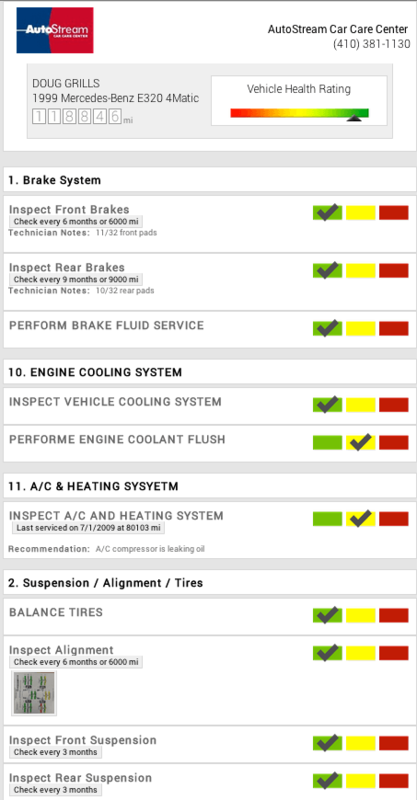 When we send you your car’s diagnosis we will include pictures so you can see what we’re seeing! We only recommend automotive services that are absolutely necessary, and by including pictures of your car, you’ll be able to clearly see the parts inside your vehicle that need work. Transparency is the best policy! After you receive your car’s diagnosis and recommendations, our friendly mechanics are of course happy to answer any questions you may have. Our Online Courtesy Check technology also allows us to easily record any conversations or repair recommendations that we have with you. We note our recommendations right on your car repair estimate or printout, that way you’ll have a record of what we discussed and there will be no surprises. Regular vehicle maintenance, from oil changes to brake services, is very important in extending the life and value of your car, pickup truck, SUV, minivan or hybrid vehicle. At AutoStream Car Care Center, we can email or text you service reminders to ensure that your automobile stays in good working order. We want to ensure that you and your family are staying safe on the road.